My parents came to North Carolina the Monday before the wedding to help with all the last minute things that go on during wedding week (making the card box, picking up items for the mimosa bar, folding our wedding programs, coming to my last minute dress fitting, on and on). Since they were coming early and staying in our guest bedroom for a trio of nights, I put together their wedding welcome bag and left it on our guest bed for them. I decided to put together wedding welcome bags for Pete's dad and for my grandma at the same time since they had similar items. In theory, I could have put together everyone's welcome bags, but I had to make those for 100 people and I figured I would wait until my parents were in town. That way, they could help us. I laid out personalized tote bags made for us by CW Designs. If you remember, we had a post about CW Designs and the personalized maps that Carol makes. We featured a bunch of her designs in the post, all of which were amazing. Even better, though, Carol made us a personalized map for our wedding. I was so impressed with it. We were able to pick out our favorite spots -- like where we got engaged, where the ceremony and reception were, and our apartment -- and she made a map of the area with our locations highlighted. You can have your map modified to be printed on a tote bag, which is adorable. We had four made: one for my parents, one for Pete's dad, one for my grandma, and one that I used all day to carry our wedding necessities. The bag was super durable, even when multiple people were carrying mine around and hiding it under tables. The colors popped and were so vibrant, and everyone who received them were absolutely in love with the tote bags. It's definitely a keepsake to reserve for the most special people in your wedding. 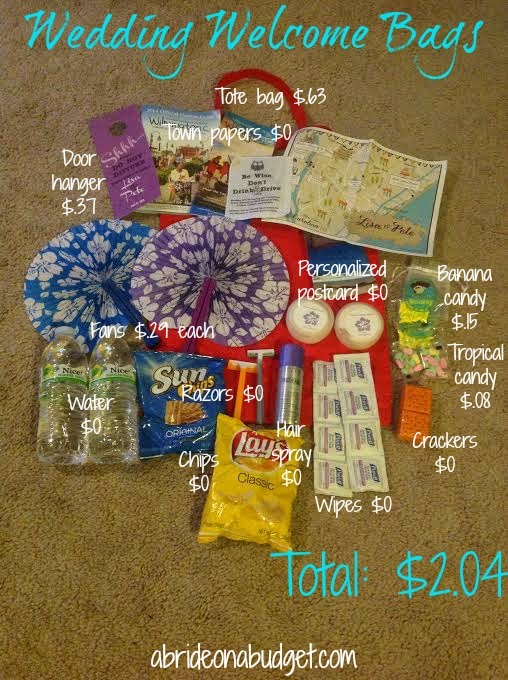 So was a lot of the other items we put in these three wedding welcome bags. 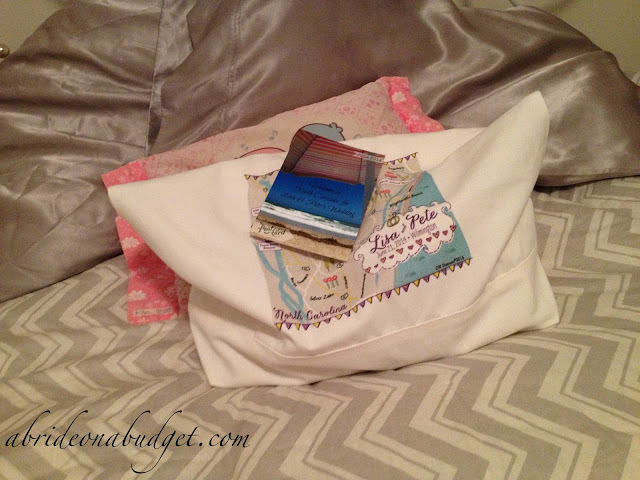 I set the bag on the guest bed and attached a personalized post card to it and left it for them to find. In the hustle and bustle of getting their suitcases and belongings up four flights of stairs after driving for 13 hours, they overlooked the bag. So of course, I had to point it out to my parents because I wanted to see their reactions. They loved the bag and were so happy with the items that were inside. When Pete's dad got to town, we gave him his bag and he loved it as well. Every single item made him smile so much. My grandma got to town three days after my parents and I hand delivered her bag (which I also added Fritos to). She was so happy. In fact, she immediately took her water bottle to the BBQ we were hosting (at the same time she got to town) and she took it with her everywhere with her. Every day she was here, I saw her with that water bottle. She really liked it. And, on the second to last day my parents were in town, I went up to their hotel room and saw they each had their personalized water bottles on their respective nightstands. It made me so happy to see them getting so much use. The bags went over so well and were such a great way to make them smile. 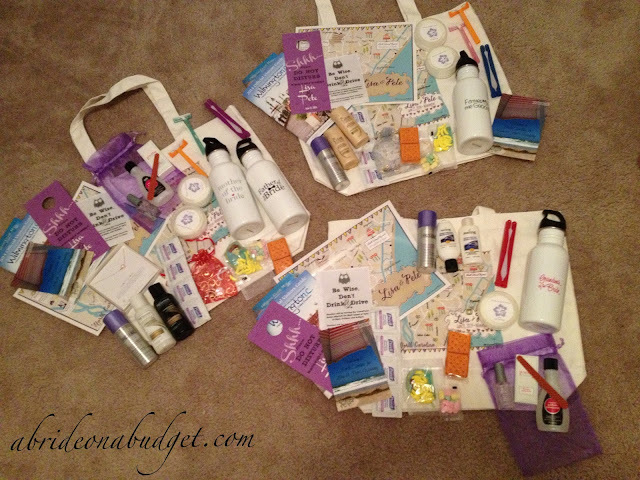 BRIDAL BABBLE: What do you think about our wedding welcome bags for our parents? Want to see our wedding welcome bags for our guests? Loved the personalized map, the fan is a great idea for outdoor ceremonies or just being hot outside. Thank goodness your ceremony was air conditioned. The bags were nice, colorful, and reusable.